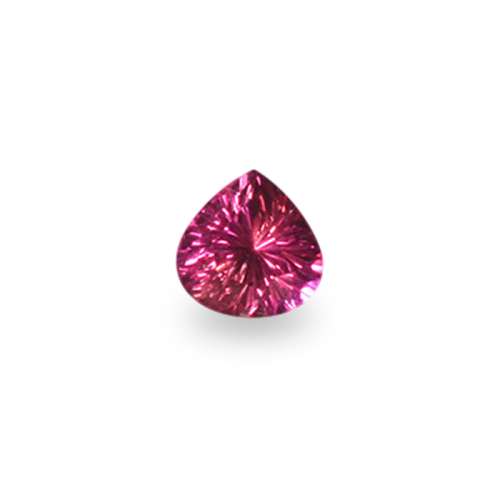 Saturate, glorious pink in an ideal pear shape with diamond-like brilliance! Unique Rose-like color! Saturate, glorious pink in an ideal pear shape with diamond-like brilliance! Unique Rose-like color! Pear shapes do not lend themselves , typically, to much brilliance because they only have a 2 fold symmetry (you can only bisect the shape in two in one direction). That is why I cut this one with a larger head to permit me to brillianteer it and force the light reflections into the tail…. making a very homogenize and brilliant gem from top to bottom!